The Detroit Red Wings have thus far enjoyed a season that only a select few predicted to be possible. The Red Wings are sitting at 65 points, currently 4th in the Eastern Conference, but just one point out of first place. A majority of the media attention has been focused on the continued excellence of Pavel Datsyuk and Henrik Zetterberg, the emergence of Tomas Tatar and Gustav Nyquist, and the stellar play of Jimmy Howard. However, there have been a few unsung heroes for Detroit this season who haven’t received the same attention as the aforementioned stars, but nonetheless have been an integral part of Detroit’s season. I wanted to highlight one player in particular, Darren Helm. In September, Mike Babcock announced that he wanted to move Darren Helm from the center position to play wing for Pavel Datsyuk. There were conflicting opinions as to whether or not this would work. 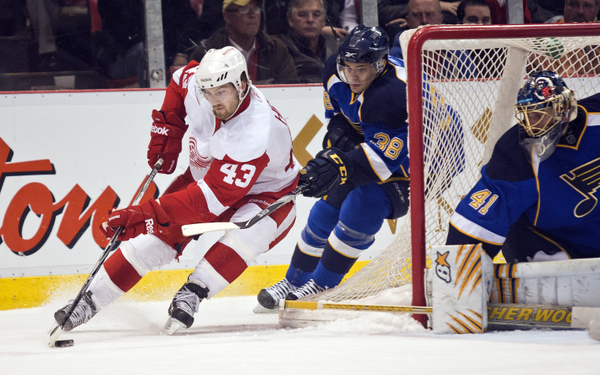 Some felt that Helm’s speed and tenacity would make him a useful player on Datsyuk’s line while others felt that Helm did not possess the scoring touch to play with a player as talented as Datsyuk. This wasn’t even the biggest question surrounding Helm entering the season as the 27-year old had missed 33 games the previous season and had played all 82 games just once in his career. This season, Helm has responded with one of the best offensive seasons of his career, scoring 9 goals and 21 points without missing a single game thus far (knocking on wood repeatedly). In fact, in games where he scores a goal, the Wings are 5-1-1 and averaging 3.29 goals per game. Sure, the questions still remain as to whether or not Helm’s hands will ever be good enough to make him a legitimate scoring threat. However, when we examine Helm’s usage adjusted possession and scoring rates, a metric devised by Domenic Galamini, we see that Helm has actually been driving possession at a high level. 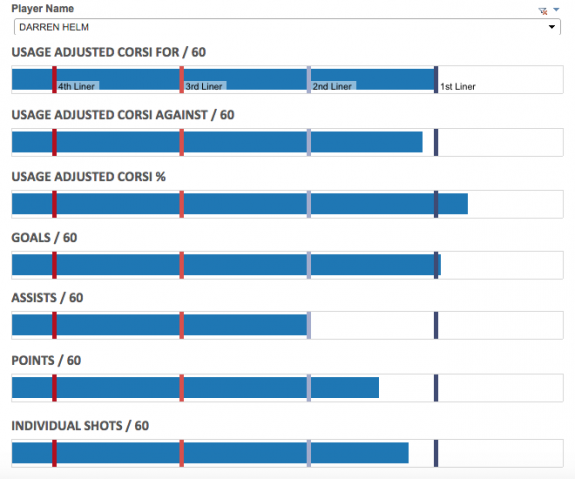 Take a look at Helm’s Horizontal Evaluative Ranking Optics chart which depicts his usage adjusted possession and scoring rates. Essentially this chart shows what would a player’s Corsi For% be in a vacuum where no other variables such as quality of teammates, quality of competition, and zone starts can affect it. Traditional Corsi For% is affected by the way a player is utilized, so Galamini has devised this metric as a way of stripping away the usage effects to leave us with this usage-adjusted Corsi For%. You can see that Helm’s usage adjusted Corsi For% is actually similar to what a majority of first line players have. Out of the 391 players to play at least 615 minutes at 5v5 over the past two seasons, Helm ranks 68th in usage-adjusted Corsi For%. By comparison, Henrik Zetterberg ranks 151st. He has quietly become a player that can drive puck possession and create scoring chances. Helm isn’t going to become a 30-goal scorer. He’s never going to be the “perfect” winger for a guy like Datsyuk, but his speed and explosiveness still allows his line to control puck possession at 5v5. He’s still one of the top penalty killers, can play on the powerplay, and is sound defensively. He doesn’t take penalties (just one minor penalty this season) despite being a ferocious forechecker. 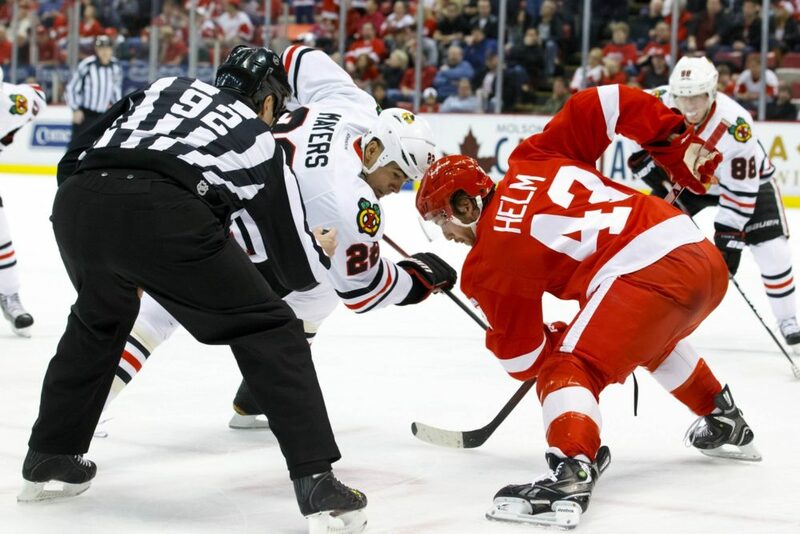 He’ll never receive the accolades of guys like Datsyuk, Zetterberg, Tatar, and Nyquist, but Helm is the type of role player that can help a team win a championship.